The three-act structure: supposedly every film has it. Or so my Intro to Scriptwriting professor told me anyway when I was a sophomore in college. On the first day of the semester, he began by asking the class, “What if I told you every movie had the same structure?” and made a chart of some movies — The Godfather, Jaws, Borat, and Harold and Kumar Go to White Castle — everybody was familiar with to illustrate the point. Except that he was totally wrong with his analysis of The Godfather. Well, not totally: he correctly asserted that Michael (Al Pacino) is the central character of the film, but in terms of his mapping of the plot out across the three acts, he was off base. Before I get into specifics, it would probably be useful to present what the three-act structure entails. Technically, it’s actually more of a four-act structure: the first act is the initial 25% of the film, the second 25-75%, and the third 75-100%. 50% of the way through — smack dab in the middle of the second act — there is a “mid-point intensification,” commonly represented as a point of no return. As acts shift, there are appropriate turning points — dramatic pronouncements — that give a story a natural arc. Furthermore, films adhere to a model of “world, character, catalyst, quest” — this is part of the chart my screenwriting professor was mapping out, along with the turning points and mid-point intensification. That The Godfather is the story of Michael’s rise to becoming the new Don Corleone is not particularly hard to figure out, as this particularly becomes evident in the film’s closing moments. The turning points, though, are slightly trickier. 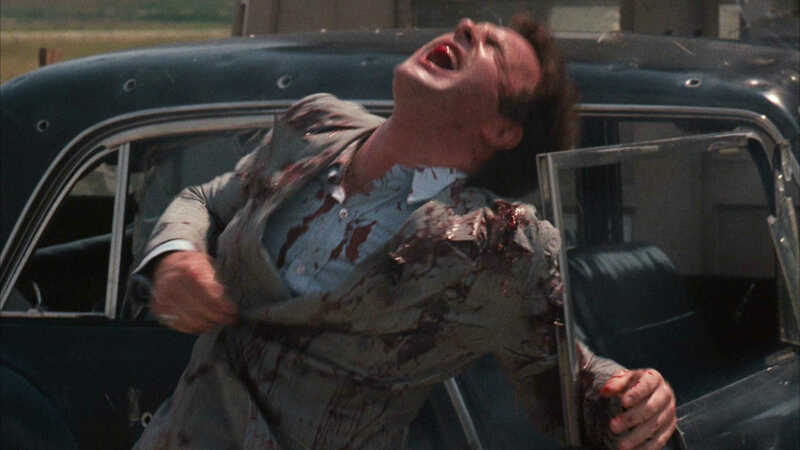 My professor, however, identified the first turning point as the assassination attempt on Vito (Marlon Brando), the mid-point intensification as Sonny’s (James Caan) assassination, and the second turning point as Vito’s death. Most problematic with this assessment is that none of these events are directly tied to Michael, the central character. Also problematic is when these events occur in the film: the assassination attempt on Vito occurs 45 minutes into the three-hour movie, Sonny’s death occurs 117 minutes in, and Vito’s death occurs 152 minutes in. While the proposed first turning point appears precisely 25% of the way through, the proposed mid-point intensification and second turning point appear far too late. 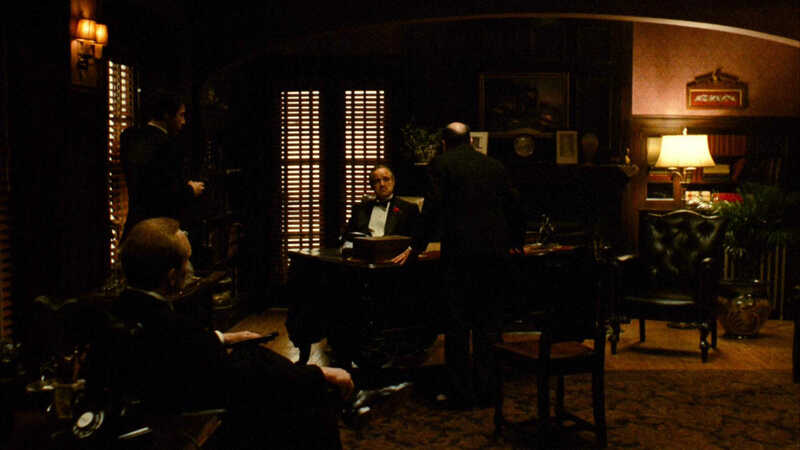 Most critically, however, the structure of The Godfather is different: there is a 27-minute prologue that precedes the film in the form of the wedding reception at the Corleone compound (thoroughly establishing the world, see), followed by the film itself, which is two and a half hours long. So, actually, the proposed first turning point that appears 25% of the way through the total running time is incorrect, as well. Rather, the assassination attempt on Vito is the catalyst that spurs Michael into action. Michael rushes to the hospital and saves his father from a second assassination attempt, moving his father to a different room so he can’t be found, and says to Vito, “I’m with you now. I’m with you.” This is the first turning point; he has accepted his quest. This moment also occurs 66 minutes in, 39 minutes after the prologue’s conclusion and 22% of the way through the “real” film. The point of no return for Michael is when he murders Sollozzo (Al Lettieri) and McCluskey (Sterling Hayden) in the restaurant 89 minutes in — 62 minutes post-prologue — and must be smuggled out to Sicily to live in the Mafia equivalent of witness protection until the heat dies down. 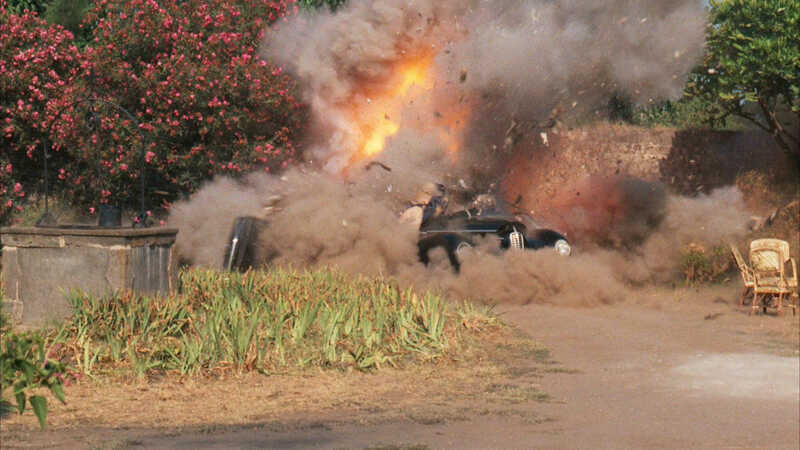 126 minutes in — 99 minutes post-prologue — Michael’s Sicilian dream life comes to an end when his wife dies in a car bomb explosion meant for him. By this time, Sonny has been killed, leading his father to then make peace with the other mafia families, and Michael can come home safely anyway. With his aging father seeking a diminished role, his eldest brother Sonny dead, and his weak older brother Fredo (John Cazale) learning the casino business in Vegas, Michael assumes the role of the new Don for the third act of the film. Spending the second half of the second act in Sicily is important for Michael, though — he visits the abandoned town of Corleone, his father’s birthplace. (At the start of The Godfather Part II, it is revealed that the nine-year-old Vito Andolini is registered as “Vito Corleone” upon his arrival at Ellis Island in 1901.) By the time he returns to America, he has a much deeper understanding of what it means to be a Corleone, and he has also been hardened by the death of his Sicilian wife Apollonia (Simonetta Stefanelli) — his proposal to Kay (Diane Keaton) upon his return is a command instead of a request (he makes her an offer she can’t refuse), and comes across as an afterthought (he tells her he’s already been back for a year or more). 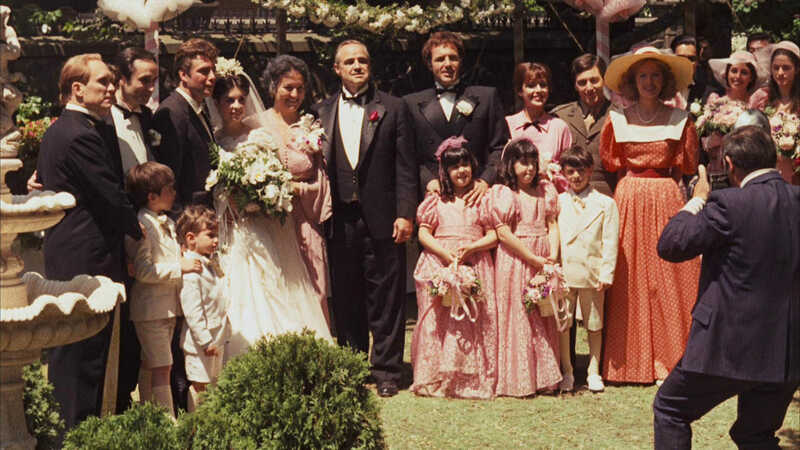 The last 9 minutes of the film — minute 173 to minute 175 are the credits — serve as an epilogue (or at least an extended denouement) that dovetails with the prologue: the wedding ushers Carlo (Gianni Russo) into the family, the epilogue sends him out. When considering the film in this light — that it really lasts from the 27-minute mark to the 164-minute mark — the actual turning points make a lot more sense. The first turning point in minute 66, the mid-point intensification in minute 89, and the second turning point in minute 126 are really 28%, 45%, and 72% of the way through the film, respectively — right around where they are supposed to be. It’s why even though there is an extended prologue — and at 27 minutes it’s a short film unto itself — the arc of the film feels very natural. Plus, the prologue does a marvelous job of submerging us in a world that is so authentically drawn it almost feels like we are spying on something we’re not supposed to see. 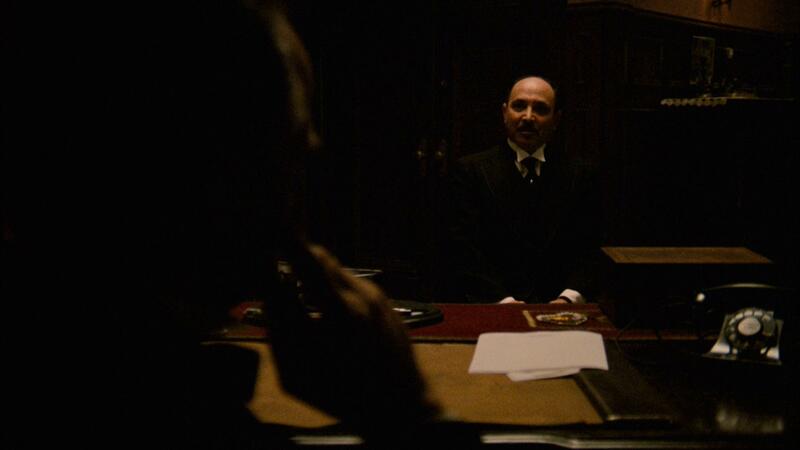 It is mentioned during the prologue that a Sicilian man cannot refuse a request on the day of his daughter’s wedding, so while the guests arrive, men file into Vito’s office upstairs to ask for favors from the Don. (The reception is held in the backyard.) As if to turn the absurdity of the tradition on its head — it is kind of ridiculous that supposedly Vito can’t say no to whatever requests are laid at his feet — Vito doesn’t immediately agree to Bonasera’s (Salvatore Corsitto) request, whose long plea for mafia justice for his daughter opens the film. “You don’t ask with respect. You don’t offer friendship. You don’t even think to call me Godfather. Instead, you come into my house on the day my daughter is to be married, and you ask me to do murder, for money.” It’s an accusation that Bonasera is desperate, and is simply exploiting a loophole. Vito knows full well he can’t refuse the request (though at first he indicates otherwise), but he makes Bonasera earn it first; he is a master at the art of negotiation. After Bonasera unsuccessfully attempts to ask Vito for his friendship (he’s done nothing to earn it), he then refers to him as “Godfather” and kisses his hand, to Vito’s approval. (Apparently only supplicants are welcome here.) But even requests granted on Vito’s only daughter’s wedding day are conditional: “Someday, and that day may never come, I’ll call upon you to do a service for me. But until that day — accept this justice as a gift on my daughter’s wedding day.” It’s a scene worth examining in much greater detail than I have given, such as the slow zoom out in the (nearly three-minute) opening shot. But it’s a fabulous introduction to the world, establishing Don Vito as an immensely powerful figure, thoroughly gaining the upper hand in a negotiation in which he technically has no bargaining power at all. 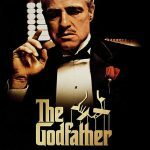 The Godfather, famous for making offers men can’t refuse, is shown on the other side of the negotiating table; it’s enormously satisfying to be introduced to a character when he is at his biggest disadvantage. 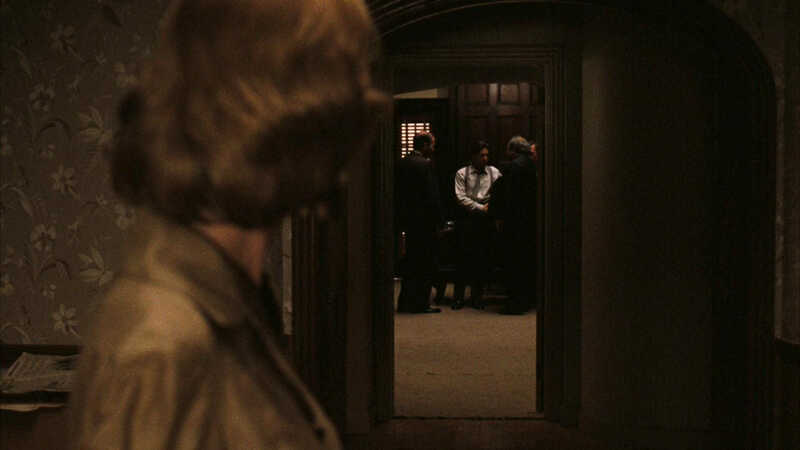 The most brilliant part of the scene, however, is that as we are watching it we don’t know that Vito is actually in a disadvantageous position throughout the conversation — shortly after the scene concludes, Vito’s consigliere Tom Hagen (Robert Duvall) explains to his wife as he heads back to work inside, “It’s part of the wedding: No Sicilian can refuse any request on his daughter’s wedding day.” Had we already known this information, it would have robbed the opening scene of drama. Instead, it’s one of the most iconic opening scenes in movie history. The family then gathers for a picture outside, but when Vito realizes Michael has not yet arrived, he calls it off and heads back inside. This one little scene creates more anticipation for Michael than it seems like it ought to, but since his father has already been defined so well, our curiosity is raised greatly by the importance Vito places on him. In most movies, we get a sense of the world, and then we are quickly introduced to the main character. The Godfather is obviously a little bit different: it still follows the “world, character, catalyst, quest” format, but it takes its time in developing the world before Michael appears. Indeed, there is no reason at all to even suspect that Michael is the central character of the film throughout the prologue. Until his father is shot 45 minutes in, Michael isn’t involved in the family operations at all. One of the chief reasons why The Godfather Part II became such a great movie in its own right, too, is because Michael’s character arc is so slowly and carefully drawn in the first film — as the new Don, he’s just gotten started in the last hour of the film, and though Part I does a superb job of tying up the loose ends and bringing the story to a natural conclusion, we’re also left salivating for more. As the film opens, Michael and Kay are the only characters we meet who are living “clean” lives. Michael is a war hero, having just returned home from combat in World War II. Until his father is shot, Michael lives outside the Corleone realm. Kay remains innocent until committing to Michael and silently accepting his proposal. (It’s with a twinge of sadness that we watch her get sucked back into things as she enters Michael’s car.) Vito’s daughter Connie (Talia Shire) and wife Carmela (Morgana King) receive pretty much no character development at all, but that’s because they are innocent bystanders — any kind of elaboration on their part would betray the film’s central premise: that in the world of organized crime, the biggest crime of all is disloyalty. Everyone in the film we get to know is guilty: even the police chief (McCluskey) that punches Michael in the face outside the hospital is a crooked cop on Sollozzo’s payroll. This is how The Godfather is able to effectively humanize the mafia, which had never been accomplished anywhere near this well in the past. By creating a world in which every single character is guilty, the yardstick used to measure the worth of a person is his loyalty to the family. As the story moves forward, this becomes critical to Michael’s involvement: at first he has no role at all, and by the end he has become even more ruthless than his father in his role as the new Don. Whereas Vito’s approach is more like that of a general, relying on charisma and leadership abilities, Michael is more coldly imperialistic, preferring to rely on brutal calculation. As the film comes to a close, Michael wipes out the other competing families in New York City during the famous baptism scene and moves the family empire out to Nevada. It’s a chess-like move: post-war American society is solidifying, with conditions in the city no longer as corrupt as they once were. In other words, the Corleone family is out of options in New York. It’s time to modernize and take the family into the territory of legitimate business. But that’s The Godfather Part II. Part I, however, reminds me of a western in the sense that those movies often take place in an Old West that is more myth than reality (in other words, it may never have even existed), and The Godfather likewise occurs in a New York City that may never have existed, either — at least not in the way it is depicted in the film. 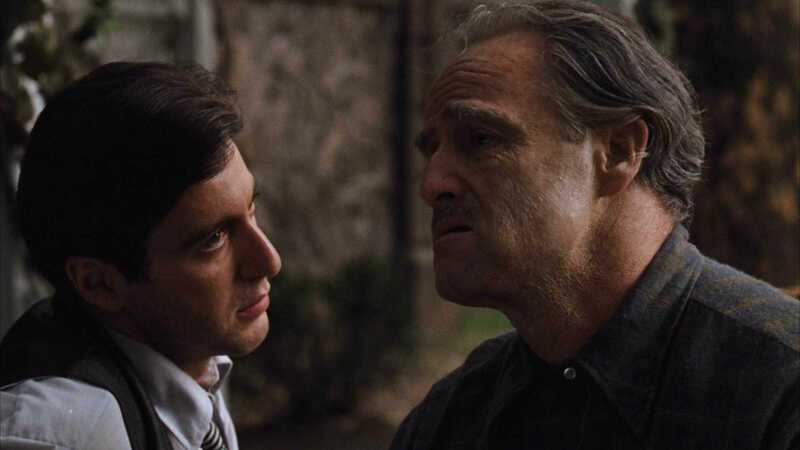 So insular is the world of The Godfather that there is no “real world” to compare it to within the film — we take everything we see at face value, even though we shouldn’t, because we are never presented with characters from outside The Godfather‘s world. Even though Michael and Kay are outsiders early on, Michael becomes the guiltiest character of them all, and Kay’s naïveté carries a curious guilt, as well — she’s complicit in Michael’s doings, even though she doesn’t know of them or agree with them. She knows better than to accept Michael’s proposal and get in the car with him, and we know she knows better, too — we watched Michael spell out for her what his family’s world is in the beginning of the film. We also watch him lie about murdering Carlo at the end of the film, of course, which is an answer Kay accepts. In Kay’s case, she’s moved from, as Michael’s girlfriend, an outsider who has no idea what is going on to, as Michael’s wife, someone who is ultimately too close to the family to have any perspective on what is actually happening around her. Tellingly, we aren’t shown Michael and Kay’s wedding — if we got to see that, we would meet too many “real” people, like Kay’s parents, who would expose how despicable the world of organized crime is simply by reminding us that there are ordinary people (i.e., potential victims of organized crime) out there. Instead, all we see are characters who exist on a particular plane: the members of the Corleone crime syndicate, their sworn enemies, and those who operate in between. Make no mistake, the film is not a full-bodied, realistic depiction of post-war America, but The Godfather‘s universe is all the richer because of it. I believe in America. America has made my fortune. And I raised my daughter in the American fashion. I gave her freedom, but — I taught her never to dishonor her family. She found a boyfriend; not an Italian. She went to the movies with him; she stayed out late. I didn’t protest. Two months ago, he took her for a drive, with another boyfriend. They made her drink whiskey. And then they tried to take advantage of her. She resisted. She kept her honor. So they beat her, like an animal. When I went to the hospital, her nose was a’broken. Her jaw was a’shattered, held together by wire. She couldn’t even weep because of the pain. But I wept. Why did I weep? She was the light of my life — beautiful girl. Now she will never be beautiful again. This is what I meant when I compared the world of The Godfather to the Old West. 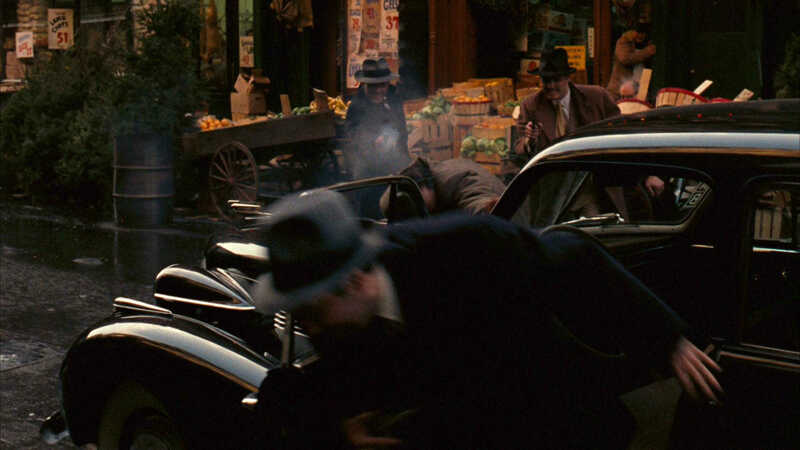 Even though we don’t spend any time in Little Italy (that I’m aware of) in the first film, we’re still allowed a look inside a world (i.e., mafia life in 1940s New York City) that probably never even existed; the film instead uses the setting as a springboard to create a new mythology. (Incidentally, the flashback scenes in Part II strike me as likely being much more in line with what life must have been like in the insulated world of Little Italy in the 1910s and 1920s.) For example, Vito only speaks Italian/Sicilian in his sequences in Part II — yet he speaks pretty clean English in Part I for someone who never speaks a word of it for the first twenty or thirty years of his life. This is pretty much an impossibility, given that 1) Vito never receives any kind of formal education at all, 2) his exposure to American English is limited in Little Italy, and 3) I have never met someone from outside America who doesn’t speak English with a noticeable accent. At the end of The Godfather, we can sense that the walls of this world are caving in. Time is moving forward (the script wisely begins to move along at a much brisker pace once Michael takes over), and the gentrification that eats away at Little Italy over the next several decades is already underway. (This is only cryptically addressed in the film through Michael’s stated aims to take the family business legitimate.) The annihilation of the competing mafia families during the film’s climax fails to establish Michael as the most powerful figure in the city. Rather, it causes water to rush through the dam, since all of the corrupt connections with the outside world held in place by the other mafia families are severed, and the Corleone family has to flee to Nevada before the real world can catch up with them. Similarly, life as the head of the Corleone empire completely overwhelms Michael’s former sensibilities, eroding them to corruption. In the final scene with Michael and his father, Vito senses what’s happening, explaining, “I never wanted this for you” — he always wanted to see Michael become a Senator or a Governor. Vito always maintained a sense of honor in his role as the Don due to his emphasis on family and loyalty. As Michael steps into the role, the shadow of his father eats away at him. But whereas Vito valued his family to still feel human, Michael demands familial loyalty simply because it’s so integral to the established business model. This, of course, leaves his soul permanently empty: Throughout his “baptism in blood,” he is in fact renouncing whatever claim he used to have on living a good life. In fact, family seems to be of dubious importance to Michael after he returns from Sicily in the wake of Apollonia’s death. He was truly in love with her, and was hardened considerably by her death — all of his ideals seemed to die with her, including those of having a family of his own. Upon his return, everything is business — including his proposal and marriage to Kay. It’s a good bet that Michael never even mentions to Kay that he was married to Apollonia at any point in their relationship. Part of this reserve is because, of Michael and Vito, Michael is the more introverted of the two. He is the classic INTJ (the strategist) on the Myers-Briggs Type Indicator; his father, an ENTJ (the chief). The position of Don Corleone demands detached, chess-like decision-making, and when it comes to real-life chess masters, Michael is Bobby Fischer, and Vito is Garry Kasparov. (Fischer famously disappeared for decades, while Kasparov, after retiring from chess, has dedicated the past decade of his life to politics and activism in his native Russia — although a bit extreme, this illustrates the fundamental difference between the two types.) Michael prefers to mastermind everything by himself — we never see him ask anyone else for counsel — while his father is more extraverted, frequently asking the opinion of his advisers before coming to a decision. Furthermore, while both are feared, Vito is ultimately admired and respected, as well, and is willing to reward those who are loyal. Ultimately, this creates bigger shoes than Michael can fill, and it’s why he opts to let the ceiling cave in on their New York operations and reestablish the Corleone home base in Nevada — he recognizes that the world his father has built is unsustainable in the modern world with him at the helm. 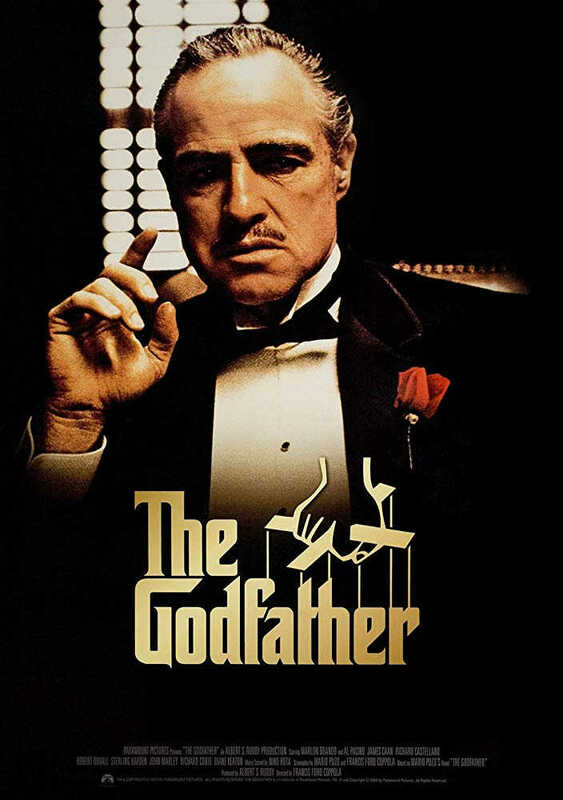 The Godfather is frequently counted as one of the very best movies of all time, and by default one of the two or three greatest American films of all time, as well. Without question, The Godfather is a Great American Film. It also has more pop-culture weight than most of American film’s upper echelon, as well — Star Wars is probably the only movie near the top of the American Film Institute’s list that has more power, culturally speaking. (Let’s be realistic here: the average American hasn’t seen Citizen Kane.) It’s a rare movie that was made recently enough to not be thought of as “too old” to most young folks — since it was made post-1967 (when Hollywood movies really modernized), it doesn’t have the feel of an old film. Yet it was also made long enough ago that it broke considerable ground: no film had so completely humanized the mafia before; The Godfather‘s rich universe speaks for itself. 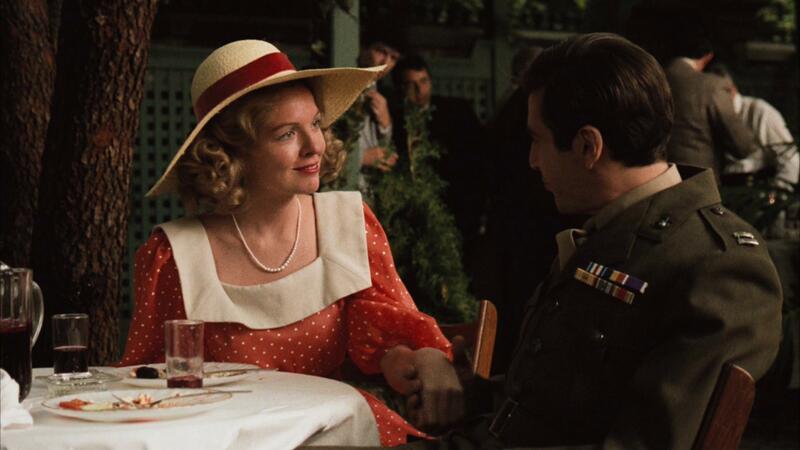 The Godfather also won Best Picture and Best Adapted Screenplay and…well, nothing else. That was it. It seems like a surprisingly low total now — Cabaret took Director and seven other awards that year, incidentally — but I think The Godfather‘s successes are more filmic than cinematic in retrospect. (Of course, the Oscars award movies that are principally more filmic than cinematic, as well.) The editing, for instance, is not very good in places, and I don’t think that, as a whole, the movie is shot in a particularly interesting way. (The Godfather was not nominated for Best Cinematography, though it was for Best Film Editing.) Director Francis Ford Coppola still puts his stamp on the film, for sure — the opening shot is classic, as is the slow push in on Pacino (with Sollozzo blabbering on in Italian and the noise outside increasing) as he readies himself for murder at the restaurant. And the baptism scene, likewise, is legendary — it’s one of the best uses of intercutting in the history of film. 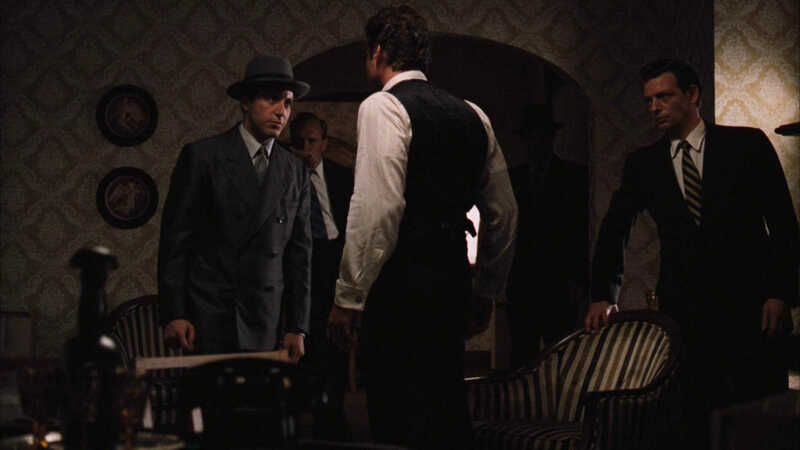 But The Godfather is a wild success because the writing — the screenplay was written by Coppola and novel author Mario Puzo — is so phenomenal; the camerawork, lighting, and direction lag a little behind, unfortunately. (The fact that I didn’t mention Coppola at all until the penultimate paragraph of this piece is an indicator of this.) I think that’s why the film fares slightly worse on the Sight & Sound polls (which emphasize cinema) — yeah, there are two: one for critics, another for directors — than on the AFI list (which emphasizes film). But make no mistake, The Godfather is a cultural touchstone and one of the greatest movies of all time — it’s one of the richest stories ever told on film. That’s why there was still room for another movie two years later that was even better than the original.